1.3 Please read these Terms carefully. Please note that nothing in these Terms affects your statutory rights as a consumer. For more information on your statutory rights, contact your local Trading Standards Office or Citizens Advice Bureau. 1.4 By placing an order on the BBL Website you agree to be bound by these Terms. If you do not agree to be bound by these Terms then you may not order any products from the BBL Website. 1.5 We recommend that you save or print out a copy of these Terms for future reference. 2.1 You agree that any order made by you is an offer to purchase the products listed in your order (“Products”) on these Terms. All orders submitted by you are subject to acceptance by us. We may choose not to accept your order for any reason without liability to us. 2.2 Once you have submitted an order to us, we will send you an order acknowledgement email with your order number and details of the Products you have ordered. Please note that this email is an acknowledgement that we have received your order and is not an acceptance of your order. Neither the placing of an order, nor the receipt of money by us, creates a binding contract between you and us. Acceptance of your order and the formation of a contract of sale between us and you will not take place unless and until the Products have been despatched to you. 2.3 When placing an order for the first time, you will be required to register with us and complete certain required fields on an online form. We will ask you to supply an email address and password for you to be able to access certain areas of the BBL Website, such as the My Account section of the BBL Website (“Secure Access”). Where we do so, it is on the condition that you shall be responsible for ensuring that such Secure Access is kept secure and confidential at all times. You shall comply with all security directions and/or recommendations given by us and inform us immediately if you become aware of or suspect any unauthorised use of the Secure Access or if the Secure Access becomes available to an unauthorised party. Without prejudice to our other rights and remedies, we may suspend your access to the BBL Website, if in our reasonable opinion, such action is necessary for safeguarding the BBL Website. 2.4 In the event that prolonged inactivity causes your connection to the BBL Website to fail, your selection of goods may be lost. In such case, you will be required to re-enter your selection. 2.5 Before you submit your order, you will be given the opportunity to review your selection, check the total price of your order including the costs of carriage where applicable and correct any input errors. All information on the BBL Website is an invitation to treat only and is not an offer or unilateral contract. 2.6 If products are shown on the BBL Website but are not available or are incorrectly priced or otherwise incorrectly described, we shall not be obliged to sell you such products. 2.7 We endeavour to despatch products to you within 7 working days of your order. However, in some cases you will be told that there will be a delay between order of Product and our despatch of the product to you as products are often made to order. In such cases you will be informed of this in advance and your placing of an order in these circumstances will constitute an acceptance by you of the delay in receipt of the Products. 2.8 You will be charged for the Products which have been ordered by you together with the relevant delivery charges and taxes. 2.9 Although we have made all reasonable efforts to correctly display product colours, sizes and other information on the BBL Website, we cannot guarantee that these will be accurately represented. 3.1 All prices on the BBL website are stated in British pounds sterling. They include any VAT payable but exclude delivery charges and any VAT on these delivery charges. Delivery charges will be disclosed prior to checkout. 3.2 We endeavour to ensure that all pricing information on the BBL Website is correct. Occasionally, however, an error may occur and Products may be mispriced. If a Product’s correct price is lower or higher than the price stated on the BBL Website, we will contact you and ask you whether you wish to proceed with the order at the correct price at which point you may cancel your order and we will confirm this cancellation in writing via email. We will not be obliged to supply Products at an incorrect price. 3.3 We may vary the prices listed on the BBL Website at any time and without any notice. 4.1 The total cost of your order will be the purchase price for the Products, plus delivery charges and any relevant VAT or other taxes. 4.2 Please note that we accept payment in British pounds sterling only. 4.3 You confirm that the credit/debit card that is being used for payment on the BBL Website is yours. All credit/debit cardholders are subject to validation checks and authorisation by the card issuer. If the issuer of your card refuses to authorise payment, we will not accept your order and we will not be liable for any delay or non-delivery and we are not obliged to inform you of the reason for the refusal. We are not responsible for your card issuer or bank charging you as a result of our processing of your credit/debit card payment in accordance with your order. 6.1 Orders will be sent to the delivery address that you have supplied during the ordering process. We cannot be held responsible if that delivery address is incorrect. Please note that we do not deliver to PO boxes or temporary addresses. Please note that there are restrictions on the locations to which we deliver products purchased from the BBL Website. 6.3 Once a Product has been received by you, all risk of damage to, or loss of, the Product shall pass to you. 7.1 If for any reason the Product you have ordered does not meet your expectations and you wish to return it, please send it back to us in accordance with section 7.2 below, within 14 days of receipt by you and we will arrange for it to be refunded. We accept the return of items only if they are in their original condition & returned with all packaging and labels and with original valid proof of purchase, according to the instructions on order documentation received and at your cost and risk. An email will be sent to you confirming your replacement product or refund. Please note that if you are receiving a refund it can take up to 5 working days for the funds to appear in your account. 8.1 Brainy Bike Lights Ltd (“Brainy Bike Lights”) warrants to the original owner this Brainy Bike Lights Bike Symbol Light product (the “Product”) against any defects in materials and workmanship and shall provide warranty services and/or replacements for a period of 12 months, beginning from the date of first purchase by the original owner. If the product is not registered, proof of purchase (such as a copy of the original invoice) is required. 2. On receipt of this information, Brainy Bike Lights will provide returns instructions. 3. On receipt of Brainy Bike Lights’ instructions, mail the Product to Brainy Bike Lights. (i) The warranty does not apply to batteries or to any Product that is not installed in compliance with the applicable Product documentation; or (ii) on which the original identification marks have been removed or modified. Further, this warranty does not apply to, and Brainy Bike Lights shall not be liable for: (i) Product resulting from accidental damage (e.g., bicycle accident), negligence or misuse (ii) any defect in, or failure of, the electrical supply to the Product; (iii) any defect of, or caused by, parts not supplied by Brainy Bike Lights; (iv) normal wear and tear resulting from product use and exposure to the elements; (v) modification, adjustment, repair, disassembly or maintenance performed by any party other than Brainy Bike Lights or its approved subcontractors and retailers; or (vi) due to any other cause which does not result from a defect in materials and workmanship. 8.2 TO THE MAXIMUM EXTENT PERMITTED BY APPLICABLE LAW, BRAINY BIKE LIGHTS LTD DISCLAIMS AND EXCLUDES ALL OTHER TERMS, CONDITIONS AND WARRANTIES IN RELATION TO THE PRODUCTS AND ANY SERVICES PERFORMED WHETHER EXPRESS OR IMPLIED BY STATUTE OR OTHERWISE OR ARISING FROM ANY PREVIOUS COURSE OF DEALING OR USAGE OR TRADE PRACTICE. 9.1 Nothing in these Terms limits or excludes our liability for: (i) death or personal injury caused by our negligence, (ii) fraudulent misrepresentation, or (iii) any other liability which cannot be limited or excluded by applicable law. • loss of goodwill or reputation; or special or indirect losses; suffered or incurred by you arising out of or in connection with the BBL Website, the Products or these Terms. 9.3 Brainy Bike Lights Ltd does not accept any liability for injuries or other damages resulting from the use of Brainy Bike Lights under any circumstances. 10.1 If you wish to purchase Products on the BBL Website you must provide us with the information required by us and by entering information you represent and warrant that (i) you are using your actual identity; and (ii) all information you provide is true, accurate, current and complete as at the time you provide us with that information. 10.2 By placing an order you agree and understand that we may store and process your personal data. We and our agents will use the name and address information you provide to process your order. We do not store credit card details nor do we share customer details with any third parties. We would like to be able to send you information about our own products and services by email, post, telephone & SMS. Please tick the box on the checkout page if you consent to receive such material. We fully respect the privacy of individuals who access and use the BBL Website and will never pass your details to any third party, except with your consent or as required by law. 10.3 We store the details of all orders placed with us through our online store electronically. 10.4 We have used every effort to ensure that shopping on the Internet with us is safe. Our secure server software encrypts all of your personal information sent over the Internet. In processing your Order, your information may have to be sent over the Internet more than once. At no point is your Order information sent in this way without encryption. 10.5 Although we endeavour to take all reasonable steps to protect your personal information, we cannot guarantee the complete security of any data you disclose online. You accept the inherent security risks of providing personal information and dealing online over the Internet and we cannot be held responsible for any breach of security unless it is due to our negligence. 10.6 The organisation in control of processing the information you provide is Brainy Bike Lights Ltd and we can be contacted at the following address : [ Brainy Bike Lights Ltd, 145 – 157 St John Street, London EC1V 4PW]. 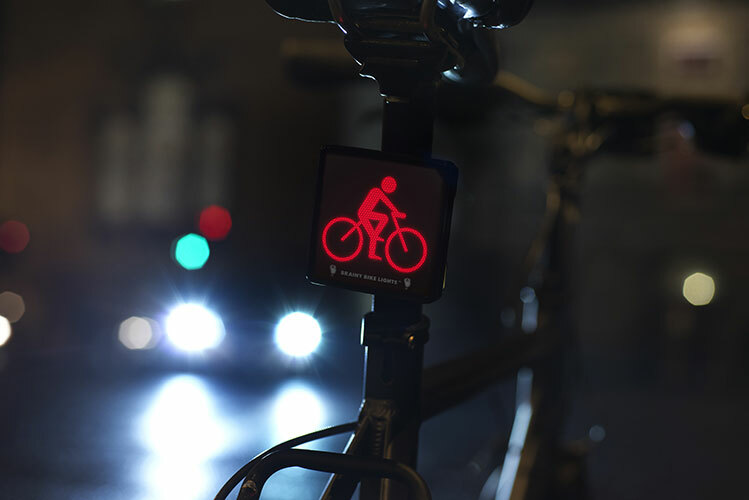 11.1 Copyright, patents, trademarks and all other intellectual property rights in all our Products and materials, content and software made available to you through the BBL Website remains the property of Brainy Bike Lights Ltd or our licensors. None of the content of the BBL Website may be copied, stored, reproduced, distributed, downloaded, republished or transmitted in any form or by any means without our written permission. 12.1 We reserve the right to transfer, assign or sub-contract all or any of our rights and obligations under these Terms provided that your rights under these Terms are not affected. You may not assign, sub-contract or otherwise transfer any of your rights or obligations under these Terms without our consent in writing. 13.1 We reserve the right to make changes to these Terms at any time. You, and any contract of sale between us, will be subject to the version of these Terms in force at the time you order the Products in question from us. 14.1 We will not be held responsible for any delay or failure to perform or comply with our obligations under these Terms if the delay or failure arises from any cause which is beyond our reasonable control. 15.1 Each provision of these Terms shall be construed separately and independently of each other. If any provision is deemed invalid, void or otherwise unenforceable, that provision shall be deemed severable from and not affect the enforceability of any of the other provisions of these Terms. 16.1 These Terms and all transactions on the BBL Website are governed by English law and you, and we, hereby submit to the exclusive jurisdiction of the English courts. This website is operated by Brainy Bike Lights Ltd.